Did I give you my secret for losing weight? Lean near to the screen and I will impart my wisdom. It’s a simple three-part formula. 3. Don’t take any crap off of anyone. See, I told you it was easy. So, having followed these rules faithfully for over a year and knowing that my mother in law is the evil nemesis of my life, why did I decide to visit her the day after Thanksgiving? Did I think pigs had perhaps learned to fly? That bears had suddenly found an alternative latrine? My husband would say we were not visiting his wicked stepmother at all, but his father whose body resides in the room with her at the extended care facility. Sadly he seems to have fled into hallucinations interspersed with naps and meals. Margaret tells us he time travels, but instead of picking some happy childhood or adult memory to visit, he lives again the terror of the depression years, eating every crumb off his plate, constantly asking the price of things and being shocked by the squandering of his money. She wastes no time telling us how awful her life is, how she is a slave to this incontinent old man who not only provides her no companionship but fights with her when she tries to dress him. I would have sympathy for her if she left any space in her own tales of martyrdom for me to insert a bit. When Pop tells us about the police car he sees in the hallway we listen with interest. It is a much superior conversation than the one with Margaret, and certainly better than hearing about his elimination problems. I sent Wrenn outside to get my medication from the car and as soon as he left the room Margaret pounced. “Well, I have no idea what’s going on with you since you swore Wrenn to secrecy” says the troll. “Margaret, whatever Wrenn told you or did not tell you had nothing to do with my instruction.” I reply. I give her details of my surgery quickly and honestly to show my openness. “You’re going to have to learn to have some self control” came her rejoinder. We go on for some time with these “when did you stop beating your wife” statements. Pop sits oblivious in the chair, missing in action, watching the fantasy that entertains him. Finally I remember my third rule, the most important one, and I said forcefully. I rejoined immediately. “The way I lost the weight was by changing my life style. I will never be tempted by that old way of living. I did not have weight loss surgery. (I did not add you are an idiot here you will note.) The doctor just removed the extra skin left over after my loss.” About this time my husband returns and Margaret, carefully not to have a witness to her attact, flees to the other room. She returns shortly and fires a parting shot. Pop continues, “I lived in fear of the police all my life.” I am frankly intrigued by this statement. I’m trying to imagine the mild mannered minister living his life in fear of the police. I get a wild hope that he is ready to confess some previously undetected youthful escapade, perhaps involving underage sorority girls and a Model-T Ford. “Oh, no, not one time,” came the answer. He mumbles something that sounds paranoid about them being out to get him, and then he nods off again. I turn to my husband, who has waited patiently to find out what happened when he was out of the room, and I give him a brief rundown. When Margaret comes back she is toting one of the annoying pieces of crap that she has been secreting in the basement storage room these 15 years. “Now I want you to respect these because they are family heirlooms that belonged to the Haley’s” Margaret has on her best scowling schoolmarm attitude. Her, “children never appreciate the things we give them” speech was just getting warmed up when Wrenn rose to leave. “Elaine’s not feeling well, so we have to go” he states definitively. Margaret is non-pulsed, unsurprised. She taps the bubble wrapped set of picture frames, trying to determine which side is glass so we can use caution. We escape after brief goodbyes, phony hugs and kisses, promises we plan to break. My husband listens to my rant until we reach the interstate, then I relax briefly. We drive in silence for a time. Finally I ask him. “What band is playing at E*nzo’s tonight? “Janet Martin” came the reply. “Let’s go,” I suggest. I know I shouldn’t ask. The day has been trying and he still has three more hours on the road before we reach home. He knows I shouldn’t go out this soon after surgery. He knows I over did it on Thanksgiving and I’m under emotional stress today, but he is a sweetheart and indulges me. It turns out it was just what we needed. We spend a lovely evening eating excellent food, dancing, and visiting with friends. The impact of the visit on us both is muted until the next day. I wake with unsettled dreams and the realization that I was not talking to my father in law and that my husband was not talking to his Dad. I realized that in all likelihood we never shall again. I think about all the words we have exchanged over the years and also know his father will forever remain a mystery to us all. I recall a few times when he has sincerely touched my heart, like when my mother died and he gave me words that were not from his stash of ministerial flash cards, but personal, sharing the pain of losing his own mother years ago. I remember when my ectopic pregnancy took the first child Wrenn and I conceived. We were his only possibility for grandchildren, but he surprised me by telling me not to try again because my life was too precious to risk. Thank God I ignored him, but still, it was sweet and sincere in contrast to so many conversations that have been conducted at arm’s length. Like many parents of his generation, that distance was deemed the proper place for a man to conduct fatherhood duties. Added to that is the public persona of preacher, for as years went by he lost his ability to slip from the public to the private man. Even his long winded autobiography skips deftly over any picture of the real person, replacing reality with fantasy as required to get to the next chapter. A life fraught with the tragedy of losing a wife he loved dearly and depended on completely, a son who took his own life in the aftermath of his mother’s death and his father’s rush to remarry, and a difficult and rebellious adopted daughter who spent her life blackmailing him, were somehow “oh, by the way” incidents in his own version of history. I know I was not there and I do not really have the right to judge. But you have only to read the scarred palms of the victims to know the pain they were forced to seal inside themselves. His role model for his family was inward stoicism and outward pretense. His relationship with his second wife floundered in the early years according to my husband’s account. He clung to the contract made in haste and grief, and like a man taken hostage, learned to love what was in his eyes an inescapable trap. He seems to have found a way out finally, the only way acceptable in his philosophy. 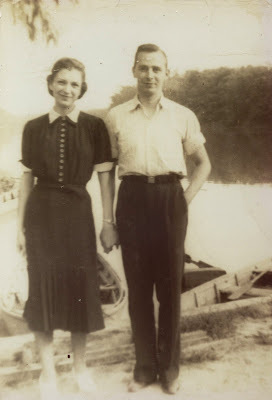 I pulled up the picture of him in the springtime of his life, the woman he loved all his life holding his hand, and I can imagine talking to the man in the picture. I have a brief urge to step into that frame and warn him, but knowing that none of us in that season of life would ever believe how our days might end. I only know I have been warned to walk cautiously as I negotiate the next 30 or 40 years.